Here is your one-stop shop for everything you need to know about latex mattresses. Latex is natural milk taken from the rubber tree which when converted into a foam provides superior comfort and durability. 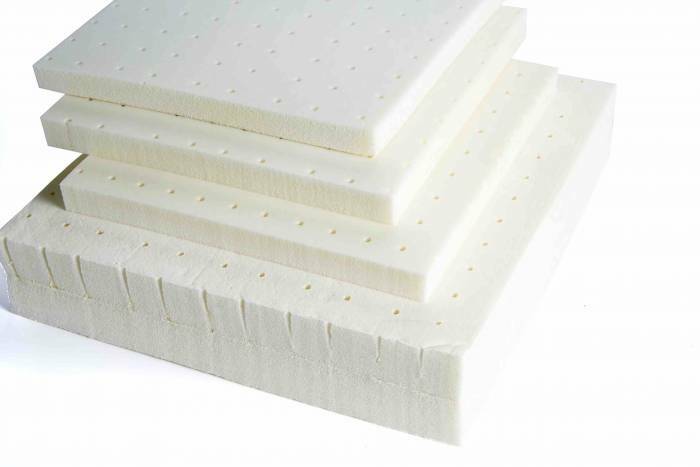 The premier latex foam mattress material also commands a premium price. The marketing jargon that surrounds latex mattresses can also make it a very tricky area. We now hope to shine some light on the truth with this article on latex. What is latex made of? Which is better latex or memory foam in a mattress? Is latex the same as Tempur and or memory foam? Tricks of the trade; when is latex not latex? What is a solid latex core? What is latex used for? Latex is a premium solid core mattress material. Latex offers superior comfort and durability when compared to memory Foam and other mattress foams. Furthermore, it is incredibly durable with some examples of Latex beds being 40 years + in age and still offering support and comfort! Latex is a derivative of the rubber tree and, in its true form, is the premium natural foam alternative. This, in turn, makes it a more expensive material. Latex is not heat retentive like some other foams and has a rapid response rate; this means it returns to its original shape very quickly. It is often classed as the top end mattress foam material. Latex is by nature hypo-allergenic, anti-microbial and dust mite resistant. With the exception of Latex allergies, it is a prime choice for those who have sensitive skin or non-Latex allergies. The key to quality Latex lies in its construction method which will usually be anything from completely synthetic, chemically reproduced Latex equivalent, to 100% Natural solid Latex. The latter being the premium material. Natural Latex is produced by the para rubber tree, Latin name Hevea brasiliensis for botanists, which originally was found native in Brazil. Seeds were collected from Brazil and stored at Kew gardens in the 1870s and reared here in the UK. They were then distributed to areas such as Sri Lanka, Malaysia and Indonesia which are now the largest latex producers. 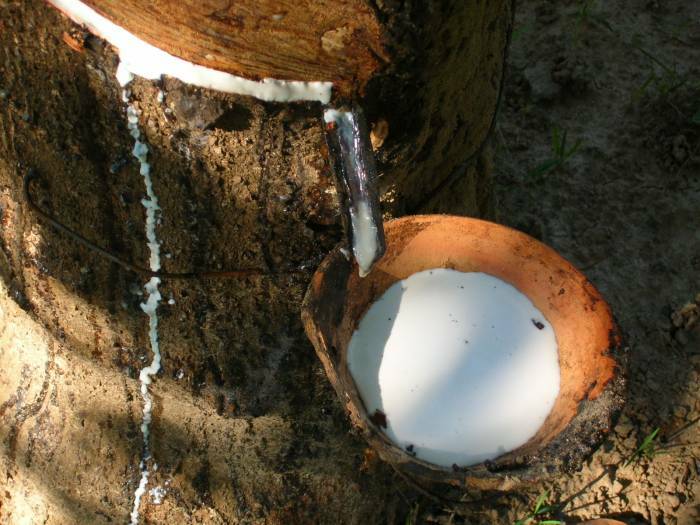 Latex is produced as a milky substance from within the rubber tree, not to be confused with the sap. These days there are a number of plantations around the world notably Malaysia, Thailand, Indonesia and Cameroon. In its natural untreated form, latex is often referred to as ‘the white gold’ due to its appearance, durability as rubber and high-quality applications. The natural milky substance is also referred to as N.R or natural rubber. 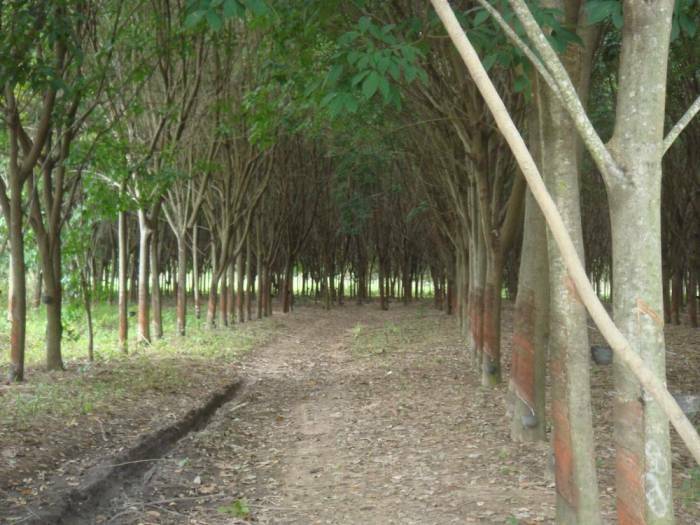 The rubber trees themselves take 7 years to mature until they can be tapped and harvested for their Latex. This a common question asked by many customers and there is the matter of personal choice, which clearly we can’t provide a definitive answer on. What we can do is compare the two objective measures. Providing you with the hard facts to decide for yourselves. We have put together a short video to explain the main comfort differences. Natural latex is a far superior material to memory foam as it does not have the associated heat issues and is a naturally breathable material. Latex has been tested side by side against other foam mattresses and has consistently scored higher in terms of durability and comfort. Sleep like the dead is an excellent resource which has tested hundreds if not thousands of beds on this score! Memory foam suffers from a slower rebound rate, the rate at which it returns to its natural state whereas latex is almost immediate. This means for those who dislike the moulding and sinking feeling in memory foam, latex can offer an alternative. Memory foam is temperature sensitive so when it’s colder, ie winter, it will be firmer than when it is hotter, in the summer months. Since we like cakes, memory foam could be compared to a simple Victoria sponge cake and latex a bespoke handmade rich fruit cake. Some like one over the other but the latex, or rich fruit cake, is made of a much higher quality ingredient list which provides a more rich result. In terms of budget memory foam is considerably cheaper and we have some excellent foams and hybrid foams that provide a quality product at the entry-level pricing. If money was no object in your decision making then a latex bed would win overall. Most customers are balancing budget, requirements, quality and durability off against each other. These are questions that are frequently searched for online. Let me start by clarifying, Tempur foam/memory foam is a completely different synthetic material compared to natural latex. They are certainly not the same thing! Whilst they have a similar pressure relieving property, they react and feel different from each other. Tempur/memory foam is heat sensitive and reacts to heat. Latex, on the other hand, reacts to pressure and moulds based on body weight primarily. Trying to compare them is unfair to both materials, like comparing beer and wine! Latex is a more advanced and natural product, if its natural latex more on that here, than synthetic memory foam. Solid core latex mattresses can also be fully turned, unlike memory and Tempur foam mattresses. One key fact to bear in mind is the depth of Latex and construction method used. As Latex becomes more and more popular bed retailers are including it in their ranges, but not always for your advantage. Due to the high price tag adding a Latex component can allow retailers to increase their prices without necessarily increasing the benefits to you over other foams. For example, a retailer may have a ‘latex’ bed in their catalogue. You may believe that this brings you the full benefits of latex. Upon further investigation, you find it is a 2cm top layer of completely Synthetic Latex, sitting on top of Memory Foam or a pocket spring unit. 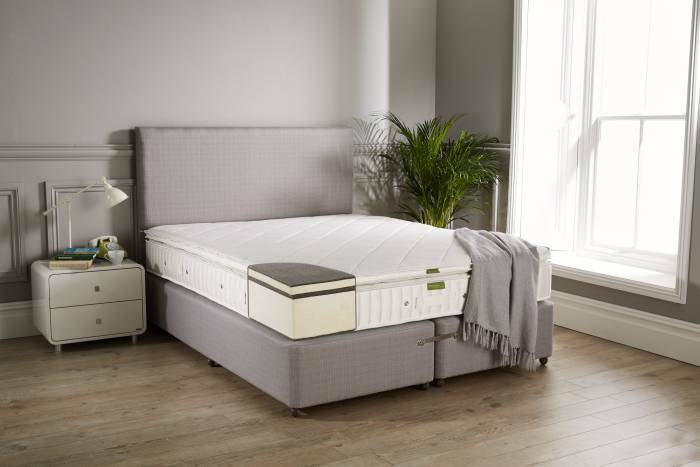 Our previous posts on memory foam have established that any layer of foams less than 5cm have no practical use as the accepted compression amount is 2cm on most mattresses. This means that when the mattress compresses, which all foams will and this is natural, your latex 2cm layer would become completely unusable. Therefore, you would have been better buying a memory foam mattress or cheaper equivalent with 5cm or more of foam! Although the mattress contains a premium material the application of it completely removes the benefit. Though you’re still left paying the price tag for it. Confusing isn’t it? Oeko-tex is a safety standard applied to the Latex manufacturing industry. Quality latex should always be Oeko-tex tested and certified. All our Latex is fully certified with the Oeko-tex standard. All of our latex products are routinely tested for harmful substances according to the Oeko-Tex Standard. Our products not only meet the requirements, but they were evaluated as class I, which is for baby articles. This is a worldwide standard. Another example is where a manufacturer claims their bed is latex when in reality it only contains partial latex, especially in mattresses that have perimeter support, where cheaper foams are used around the edges to firm up the bed. So although it contains latex again it is not a consistent application of latex. Other sales tactics will claim latex filled toppers, again which are 2cm or use 100% synthetic latex rather than natural latex. Some even contain only latex byproduct materials, which could be shredded or mixed with other fibres! The one lesson here is not all latex is the same and you need to apply the same rules of depth, density, quality to your list of must-know questions! Manufacturers may claim 100% latex, implying its 100% natural but this is false. The ‘100% latex’ label usually is 100% Synthetic so make sure you ask the right questions. Again the retailer’s version of ‘natural’ latex is usually 60% natural and 40% synthetic, at best! We have also found natural latex mattresses that are only 20% natural latex and 80% synthetic!! What latex does John Ryan By Design use? All of our solid latex beds, however, are solid core latex, so the confusion can end here. 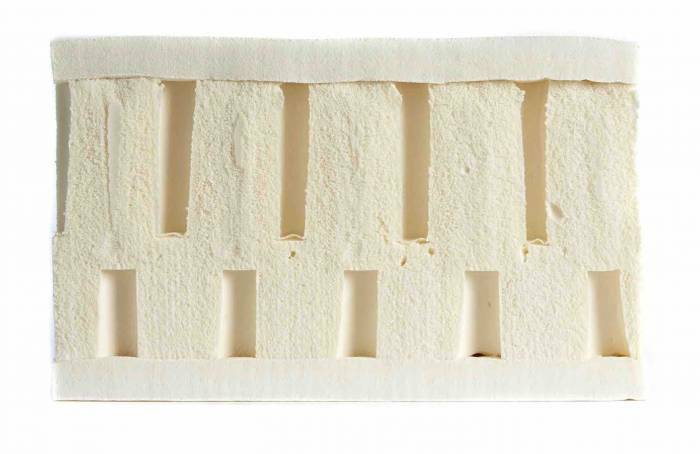 We only offer 100% natural latex variety in our solid core latex mattresses. They can be turned rotated and flipped like a traditional mattress. We only recommend solid core as its consistent and so you know exactly what you’re getting for your money, no hidden surprises! Latex is incredibly versatile, pliable and resilient and is frequently found in medical gloves, contraceptives, high-quality paints, moulds and cushioning materials such as beds. As we’ve already hinted there are many types and qualities of latex. Many tricks are used to stretch the latex claim, sorry for the pun, and to cash in on this market. There is also chemically synthetic latex made from a chemical called SBR (styrene-butadiene). Natural latex, however, has the edge as its a far more complex material with better breathability, durability, resilience and hypo-allergenic qualities that Synthetic Latex can’t fully match. Synthetic ‘SBR’ latex, however, has the edge on price as it is much cheaper than natural latex. You need to be fully aware of what type of latex you are looking at when comparing products. Manufacturers will claim 100% latex but this can mean 100% Synthetic Latex, so you need to ensure you are comparing like for like! When you unzip a latex mattress you will no doubt see lots of tiny holes or perforations. This is not because your manufacturer is ripping you off, but because these perforations are the only way the manufacturing process can get consistent heat flow through the latex when baking it. These holes are caused by pins which allow the latex to be cured consistently, like baking a cake and making sure the middle isn’t all gooey inside. It also ended up having the natural benefit of increasing airflow hence making a latex mattress far cooler than memory foam or equivalent! It is important to note that the perforations don’t necessarily go all the way through the latex, especially with our deep cores. This is no cause for concern as the perforations are there as part of the manufacturing process and not intended to always perforate the entire depth of the mattress. With a topper, ie a shallower depth of latex, you may see the perforations all the way through but with a deep core say 18cm they may only go partially through. Here is an example of the process with Talalay latex where rods are used which lead to perforations. 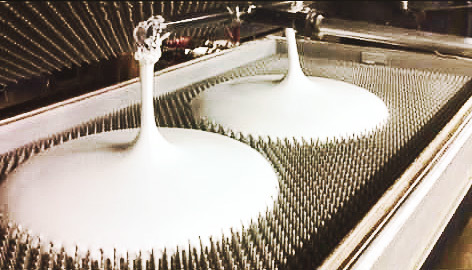 In the manufacture of Dunlop latex, this would be a larger conveyor belt with rods that cure and bake the latex. Some brands will brand a latex mattress as having perimeter support as a benefit. With quality natural latex, like the models we offer, you shouldn’t need perimeter support. All this means is that another type of material, usually a dense cheaper foam, is used around the edge, reducing the amount of latex and firming up the edges. A quality latex mattress should never need this. As you can see there’s plenty to be on the lookout for when buying a latex mattress. You need to ensure what the blend of latex is. Is it 100% synthetic or 100% natural? Chances are it’s a blend in between. Also, the density of the latex will dictate its tension which is important to note. Lastly don’t forget to check if it is solid core latex, the best construction method, if not you may be buying a mix of latex and cheaper foam. Still confused? Then give us a call on 0161 437 4419 for more help or email info@johnryanbydesign.co.uk.